"Life sure can surprise you." One of the things I love most about Liane Moriarty's books is her writing. It is so fluid and easy to read, I found myself immediately engaged with the story. With her multiple POVs, which I'll get to below, it is so easy to be lost in the story and just keep turning the pages. I found myself eagerly looking forward to the next chapter and what would happen next. She reminds me of Jojo Moyes and Tiffany Reisz in that you just feel surrounded by the story in the most relaxing way. It is true skill of writing that it reads just effortless. As wth her previous books, it is the characters that also kept me wanting more. Focused on Cecilia, Tess, and Rachel, we meet these women and pinnacle points in their lives. Cecilia finds a letter addressed to her from her husband upon the event of his death, Tess if reeling from being told her husband is in love with her cousin, and Rachel is going to be losing her beloved grandchild to NYC when his parents move for her daughter-in-law's job. What they have in common is St Angela's school where Rachel works and Cecilia and Tess' children go. Phew. Moving on. I loved Cecilia. The Mom that seems to have it all together and she really does...until this letter. I loved her honesty with herself. She struggles with her feelings and decisions and how she feels about the THINGS that happen and I loved how her vulnerability shows. Tess is vulnerability to definition. Her situation completely broke my heart and how she deals with it is incredible. I loved the choices she made and how she tried to recover from this traumatic event in her life. I also really empathized with how angry she was. I seriously hate books where bad things happen to people and they forgive the people that wronged them so quickly. No, no, no mother fucker. Hone that anger. Use it. The only character I got a little annoyed with was Rachel. While my heart completely went out to her and what happened to her daughter--you'll find out--but it got a little out of control for me. While I can't and don't ever want to imagine her situation, it was hard to relate to her actions sometimes. While I guessed the major secret of the book there were still plot points I NEVER saw coming. I thought the pacing of when we find out what is in the letter and then the aftermath was on point. The fallout and what happens after was engrossing because it was SUCH a brutal situation to be in that it brought a whole other level of depth to the book I didn't anticipate. And the epilogue? Brilliant. Slightly heart-wrenching with a side of melancholy, it really worked. While it wasn't exactly your typical happy ever after, it was real and it was honest and it was raw...basically, it was realistic. If you love effortless writing, great characters, and a good mystery...this book is for you. 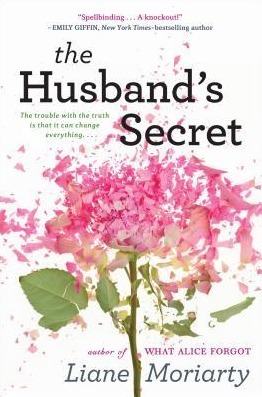 This was my first Liane Moriarty book and I was totally blown away by that epilogue. I read Big Little Lies next and somehow predicted the ending, so it wasn't AS great for me. I just love the kind of tension-filled writing she has, where it sometimes goes back and forth in time so you can see the before and after! Yes, I love that kind of dual timeline too to try and fit the pieces together! I'll admit Big Little LIes is my favorite as it's not as damn depressing as the end of this book can be lol! Great review, I loved this book too. The epilogue left me reeling!